If the task has two aspects, it will be coloured according to the higher level skill needed. Everything moves. Even things that you think are static, think of the moon, the earth, the sun, our galaxy; things you can't see, like air, bacteria and dust particles - but is this movement just random, or can we describe and predict it? As we will see in the next unit, an object’s change of motion is due to an unbalanced force acting upon it. Therefore, “an object at rest stays at rest and an object in motion stays in motion with the same speed and in the same direction unless acted upon by an unbalanced force”. Once an unbalanced force acts upon it, the object will experience some type of acceleration. A movement is a body’s change of position with time. 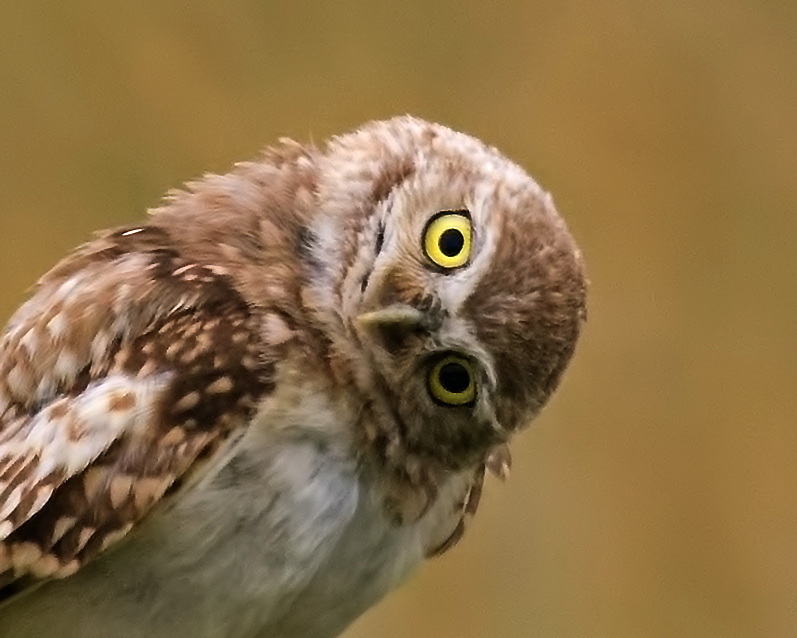 ● Motion is relative: the change of position is made with reference to a point we call a reference system. The line which describes the displacement of a body in motion is called its trajectory. Speed refers to how fast an object is moving, it is therefore the rate at which an object covers a distance. Speed has a different meaning than velocity, as speed is a scalar quantity and velocity is a vector quantity. Velocity is speed in a given direction. For our purposes, as since we are not going to see vectors this year, we may interchange the terms speed and velocity. 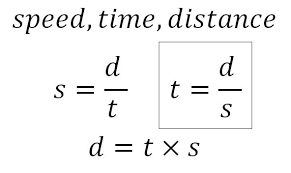 The average speed of a moving object is the displacement of the object divided into the time the object takes to cover a distance. The instantaneous speed of a moving object is the speed of the object at a particular instant. The accelerated movement is a movement in which velocity changes with time. The acceleration of a movement is the rapidity with which its velocity changes. ParaIn a rectilinear motion, the trajectory is a straight line. (such as the free fall of an apple from a tree). For a uniform rectilinear motion, the trajectory is a straight line and the velocity is constant. 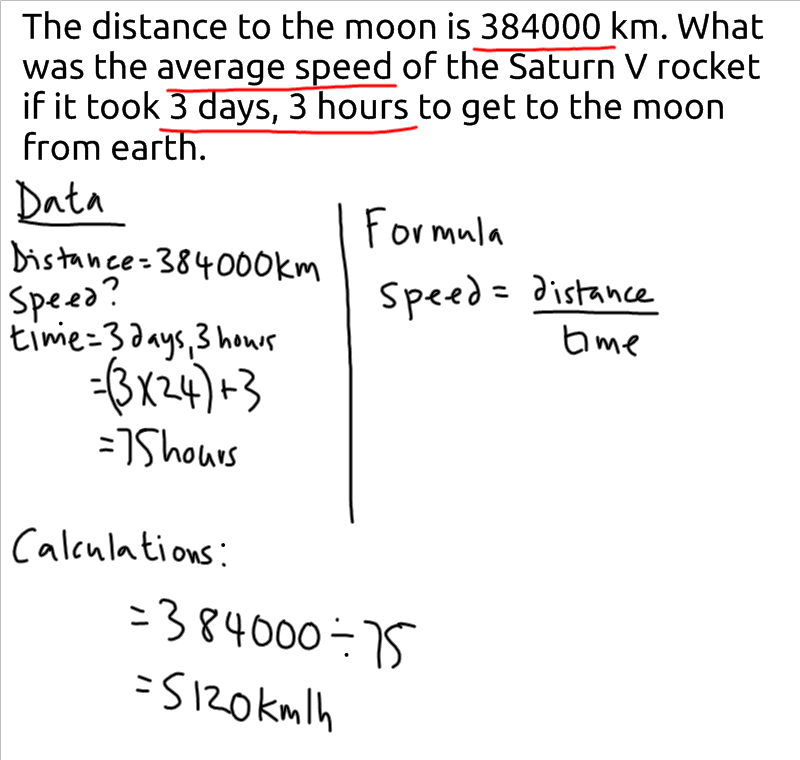 Task 7a - calculate your average speed for your journey to school. You need to time how long it takes you to make this journey. Do you think this speed would be the same every day? what would happen if there was an accident one day, or it rained? How could we find a way to take into account all these occurences? In order to get a resprentative result of the different days, we calculate the ARITHMETIC MEAN value (la media). We calculate this by taking all the indivdual values that we have measured adding them all up and then dividing the total by the number of values we have. n is the number of times we have taken the measurement. With this value we can use this formula, and calculate the average speed of each day. What units would you use for this? Finally, you can calculate the mean for the 5 days. 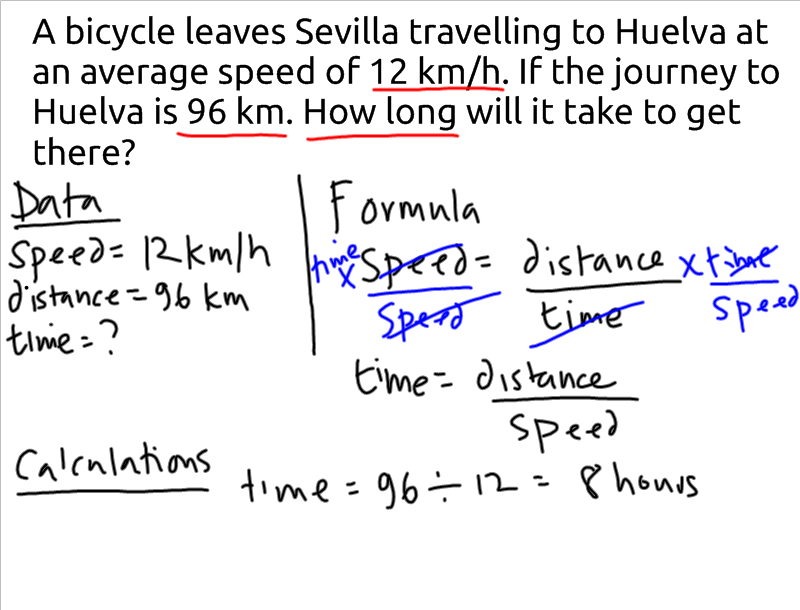 A bicycle leaves Sevilla travelling to Huelva at an average speed of 12 km/h. If the journey to Huelva is 96 km. How long will it take to get there? What is the average speed of a car that travels 45 km in 30 minutes? Human hair grows at about 1 cm/month. How long would it take to grow 1m? Write are the three quantities on the above formula, and what units can we use to quantify them? The graph below shows the journey of a meerkat early in the morning, while she is out checking if the coast is clear before all the other meerkats come out and start to do whatever it is that meerkats do. In this case, from A to B, she exits the burrow at a constant speed and moves 40 metres from the exit. Then she waits for 40 seconds without moving, then she runs another 100m, getting faster all the time (accelerating). Then she rests for another 40 seconds, before running back to the burrow, all 140 m, in one go in 40 seconds. In this case we can use the graph to see many things. 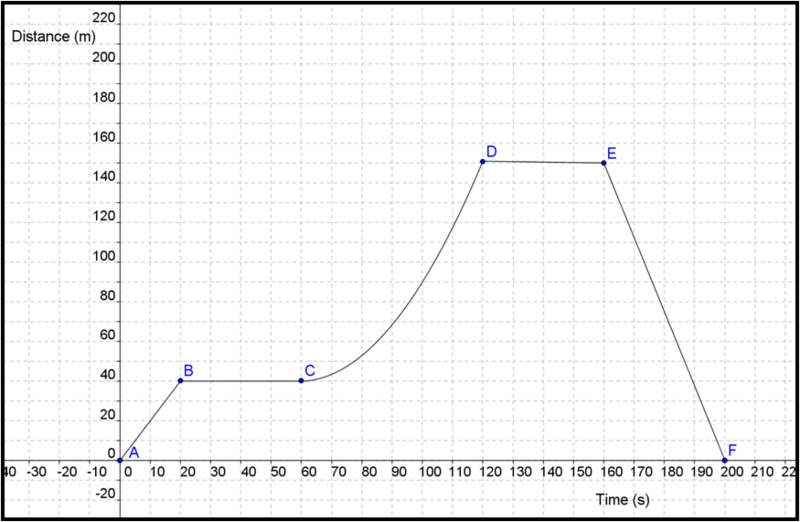 distance from the graph = 40m / time from the graph 20s So speed = 40/20 = 2 m/s. This is called an exponential curve, mathematically you will not deal with these this year, but we can talk about what it means without going into the mathematcs yet! This is similar to A to B, in that it is a straight line, but in this case the slope is opposite, (an indirectly proportional relationship). The '-' sign will be very important in the future, for this year we can say that this means the movement is in the opposite direction - the meerkat is coming back. If this is hard for you to visualise, imagine you were a wildlife film-maker, and you decided to go to get a sandwich for about four minutes, just before the meerkat came out of the burrow. You wouldn't have seen anything would you? 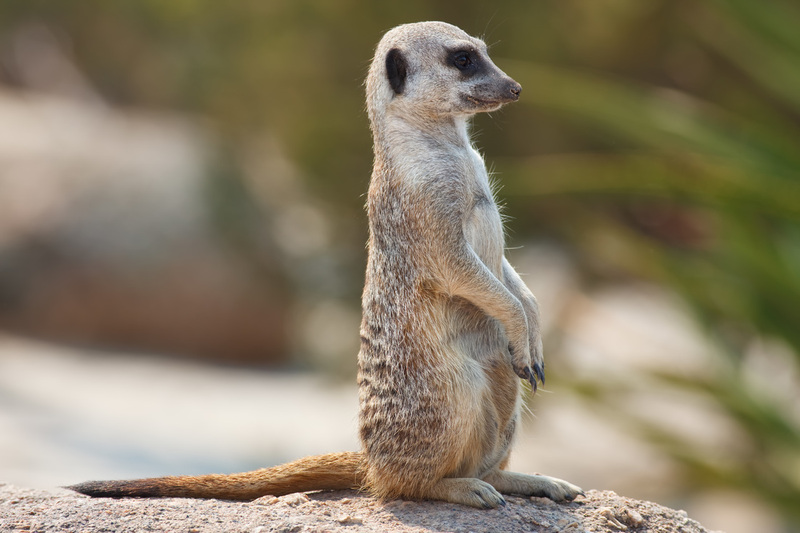 The meerkat is back where she started from.